A macaque approaches in Ubud’s Sacred Monkey Forest. Jerk. I repeated the last one because it’s important. Monkeys can carry rabies. And they’re vicious little bastards. They’re smart, and they’ll bite and claw humans for a banana (why give them an excuse to come near you?!?) or a water bottle or in my case, a new sarong in a plastic bag dangling from my fingers. But if you’re going to bother to go on vacation on the other side of the planet, you want to have a full-value experience. So it’s tempting to do stupid stuff. Quite tempting. OK, it’s imperative for that whole full-value experience thing, because when else are you going to find yourself in the middle of Bali — I’m still not even sure where it was since I was driven there — at the Tirta Empul staring down the opportunity to hop into the waist-deep water and wash away evil by dumping spring water over your head? Intact skin. Why would my skin not be intact?!? Larvae. Ugh I can’t think about larvae. 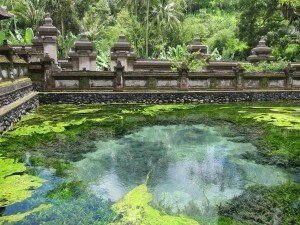 Bali’s Tirta Empul, or temple of sacred waters…is kind of growy. 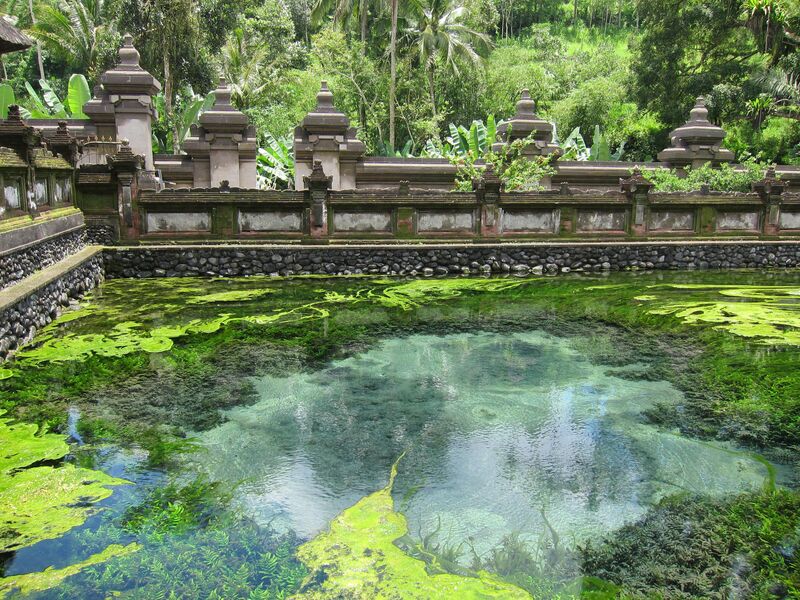 But then you’re there, and you see the algae-filled spring just behind the row of spigots pouring sacred water into the stone pool and you think, “oh it’s probably fine, even though it might not be,” and you shrug and step into the cool, refreshing water. Your sarong — which you fought a monkey for — floats up around you as you walk to the first spigot. You cup the water in your hands, hesitating. But you feel the calm wash over you, even the still-dry top of your head. Suddenly, the top of your head is dry no more. This hardly seems dangerous after you’ve heeded the warning “there’s a baby scorpion on the floor in the toilet” by slipping on your flip-flops that time, but not on subsequent trips to the toilet. Plus, if you’re me, you had to fight a monkey just to have the sarong, which is required at temples on Bali. The day before I went to Tirta Empul, I bartered for a pretty silk sarong in a textiles shop in Ubud. I still probably paid too much for it, but I wasn’t complaining…until I passed through the edge of Ubud’s Monkey Forest and forgot that the aggressive little macaques that inhabit the forest liked to try to steal anything we humans are carrying — especially easy gets, like a dangling plastic bag. My left hand met my right to pull the bag back with both hands as I looked at him and growled, grrr! 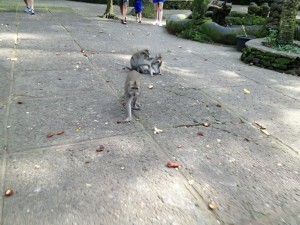 Do not, if you go to the Sacred Monkey Forest, growl at a monkey. Don’t even do a quick little growl like I did. This is a terrible idea. Even though it totally worked. The meanie macaque gave up, let go of my sarong and walked away. And I like to think that the along with the evil in my soul, the sacred waters also washed away any leftover monkey spit on my sarong.